Markets are open in Asia and they’re up. Japan’s Nikkei is up 1.8 per cent. Australia’s S&P/ ASX is up 0.8 per cent. Korea’s Kospi is up 0.1 per cent. For months Japan’s markets have been moving on expectations for aggressive easy monetary policy. The yen has been going down, and Japanese stocks have been going up. 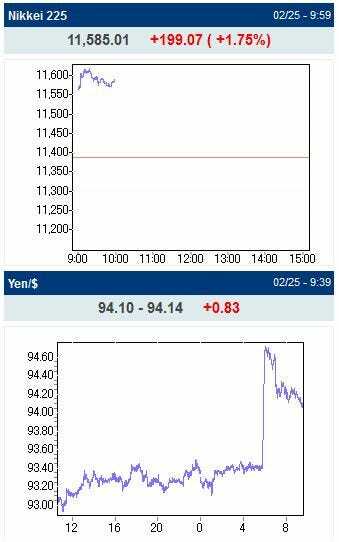 But just when you thought those efforts were priced in, the latest news out of Japan is pressuring the yen again today. His name is Haruhiki Kuroda, the man expected to be the next governor of the Bank of Japan. Kuroda is known for being particularly dovish, and the markets appear to believe that he will be able to execute Prime Minister Shinzo Abe’s plans to stimulate the economy.